Культурная ассоциация Art Photo Travel учредила международную премию для фотографов. Участвовать могут, как любители, так и профи. Премия объявлена с целью продвижения искусства фотографии. Это серия инициатив, направленных на повышение престижа участников конкурса на мировой сцене, трамплин для талантов, новых фотографов, еще не оцененных по достоинству. Партнеры премии: административный центр Сиена и Университет Сиены (Италия). Состав жюри подобран, чтобы премия достойно отвечала международному статусу. Участие платное. Работы финалистов планируется представить на выставке, что станет выдающимся событием, благодаря туристическому потоку Сиены. The Cultural Association Art Photo Travel, sponsored by the City of Siena and the University of Siena, has launched the International Photo Contest "Siena International Photography Awards", International Photography Prize, where photographers around the world, amateurs and professionals will be able to partecipate. People (and familiars) who are part of the jury can't take part in this contest. The aim of the competition is to promote the art of photography through a coordinated set of initiatives designed to provide an international stage and a vision of absolute importance and prestige to the partecipants. The initiative also wants to be a springboard for new talent in a context within the figure of the photographer is not often appreciated as it should be. 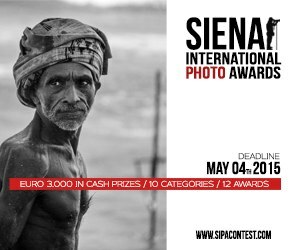 The profile chosen to adopt a qualified panel of judges and experts is in line with the intention of the Organising Committee to nominate the competition "Siena International Photography Award" to a prominent place in the photography international overview. In this perspective, the competition will be followed by a photographic exhibition of the inning and finalists works who will give the event a showcase of out standing importance thanks to the high tourist flow that affects the city of Siena.